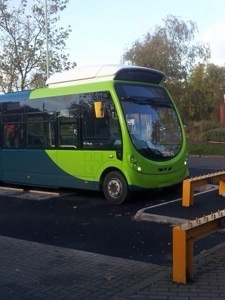 One of Arriva’s new electric buses for Route 7 has been travelling around town on a number of road tests. 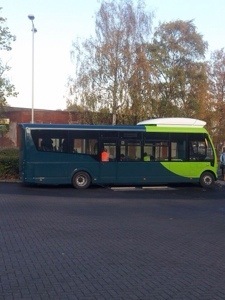 This entry was posted in Arriva The Shires, Buses, Milton Keynes, Out & About, Photos, Work. Bookmark the permalink. Mmm. The whie thing looks a bit wierd. Hope they do some decent marketing to promote it. Pity there will not be a service increase. Yes it does look odd with that roof pod. I think given that full size buses are in use on the 7 at times there is a risk of overcrowding and thus diesel buses having to be chucked in the mix. And yes Streetlites are pig ugly generally, though it would look better if they painted a rectangular black window surround on it rather than that nasty jagged bit. Yes Neil totally agree with your comments re. Window layout. It’s strange with the Streetlites. Normally Wright buses are very pleasing on the eye.